The major issue we recognize about handheld devices like smartphones, tablets or other touch screen devices is typing difficulties. For the sake of typing convenience, majority of users just avoid typing anything long on their phones, tablets tapping on-screen keys. So, to ease typing on touch screen phones and tablets, many developers have come up with unique idea and method of typing. 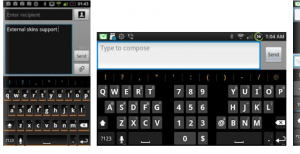 Android is one such flexible ecosystem which provides scope for third-party keyboard apps. So, lets find out some of the best keyboards apps available for android phones but before we do that, lets see how to enable and configure them because most of the times, users complain that it is same as the old keyboard, nothing changed whereas in reality, they’ve not even enabled the new downloaded keyboard and activated it as default. Download and install keyboards apps from the suggested list below. Press menu option on your phone, go to settings -> Language and Input. Put a tick mark in the desired keyboard list shown there to enable it. 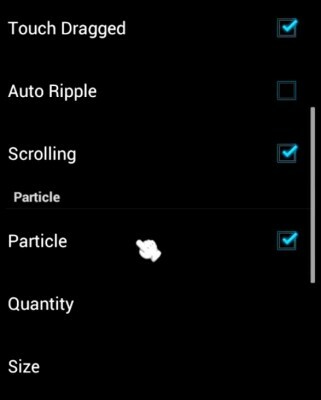 Now tap the option marked Default and choose the newly downloaded keyboard to activate it as default typing/input method. If android prompts any warning that the app may collect personal data including passwords, you may safely ignore that warning in this case. Boy, this is the best android keyboard that I recommend to anyone. It saves me a lot of time and helps me text at incredibly faster speed. You just press a key and it suggests the whole word you wanted to type, press another key, it guesses the next word you might wanted to type. In nutshell, it saves a lot of time, makes typing on phones really easy and very faster with minimum key-press. How does it do so? Well, it is based on predictive text input method and it predicts the word/phrase you want to type but its prediction is not just based on standard language dictionary, but also based on your own communication style, acronyms you use, custom non-existent words you use and also if you type in transliteration way i.e. typing in English but the words mean valid in another language, not English(for example, Hinglish typing style for Indians, or People Names which are not valid in dictionaries). It learns smartly from everything you text, whatever you often type, from your Facebook, twitter, gmail or other email account so that the next time you want to type something, it makes the exact, accurate and smart guess. It even corrects your typing mistakes. So, apart from native English language users, Swiftkey is also best if you type in English but you mean in another language. It supports a lot of languages like English, Arabic, Czech, Hungarian, Portuguese, Greek, French, Spanish, Urdu, Russian, Korean, etc. For a complete list of languages supported, visit the download page on Google Play Store. Download Swiftkey 3: It is a paid application which can be purchased from here but comes with a free trial version also if you want to try it before you buy which can be downloaded from here. After downloading it, installation is quite simple as the application itself guides you step by step as how to proceed with it. For voice based input, it uses Google’s default voice input and recognition capabilities. Both these keyboards are pretty much alike but with minor differences. Typing on these keyboards in one-handed one-fingered operation. Swipe your finger along the letters making your word and these apps output the desired text in a very natural way. This is fun, intuitive, and new typing way and works great for supported languages. Swype is currently available in beta version for free but unfortunately it can not be download from Google Play Store. You need to sign up for beta on its official website and download it from there. You may also have to enable Unknown Sources option found in phone security settings to allow installation of non-market apps. But it worth going through such hassles. Next word prediction, Advanced and Dynamic language model to maintain your personal vocabulary along with personal dictionary editor, people names learning based on your phone contacts, gesture support for cut-copy-paste, etc are other features that make Swype more powerful along with support for over 55 languages. It has inbuilt Dragon voice recognition for voice-based input but this feature is not great. In fact, I advise using default Google voice recognition which is very accurate and works well in various speaking accents globally. On many Samsung phones, Swype is installed by default in which case you’ve to activate this input method as your default keyboard. Download Swype from here . The given link is registration link for beta download signupwhich is required for you to get the app download link right in your inbox. Slide IT keyboard is paid app and is available for purchase on Google Play Store from here. It has over 45 languages support, smart predictions, several keyboard themes/skins, and other keyboard customization option. It is also available as trial version for 15 days under the name SlideIT Soft Keyboard which can be downloaded from here. Which one is better? This question has subjective answer and depends on personal preferences. But if you want a great swiping kind of keyboard with amazing prediction and featured result for free, just go for Swype. Most of the articles on internet talk about best keyboards which compete with each other but in this article, we also want to list such keyboards which are more suited to a particular purpose therefore worth having them to use in such ‘particular’ cases. If you’ve been vying for a keyboard which is similar to your laptop/computer keyboard with tab, esc, ctrl keys, Hacker’s keyboard is right for you. This is useful when we’re required to use these special keys in applications such as SSH access or providing remote computer support via phone/tablet, or other uncommon peculiar cases. This five row keyboard looks very well on android tablets with arrow keys also for such devices that don’t have trackball or D-pad. It also supports several languages including English, Hebrew, Arabic, Italian, Persian, Turkish, etc. For a complete list of language packs, visit Google Play Store and download Hacker’s keyboard android app for free from here. This keyboard is for people who use their big size android phones or tablets to type in landscape mode. The keyboard splits halfway so that keys are easily accessible from the corners within the reach of your thumbs. This makes typing with thumb easier and much more convenient. So, we recommend this if you’ve a phablet (Galaxy Note) or a phone larger than 4 inch sized or a tablet of 7 or 10 inch. It features multi-touch, swipe gesture, google voice typing, auto-correction, keyboard shortcuts, etc but support for very few languages. Spacing between keys can be adjusted easily. Split layout is well tailored in specific templates for 5 inch, 7 inch, 10 inch android devices. Furthermore, you can specify different layouts each for portrait and landscape orientation. This is also a paid keyboard app and can be purchased from Google play store here. If you’re already on the latest Android os i.e. Jelly Bean, you might be appreciating the improved in stock android keyboard as prediction method and layout has improved significantly. For users, who are on Ice Cream Sandwich or other previous version of Android, some developers have made praiseworthy effort to port Jelly Bean keyboard to older version of android. You can download Jelly Bean Keyboard from here. The app is free and doesn’t contain ads. To reward the developer’s effort, you may wish to buy the donate version. Go keyboard – It is more than just a free android keyboard app with support for the most number of languages including Hindi. Several themes and emoji packs available for this keyboard. This is free android keyboard app and can be downloaded from Google Play Store. Smart Keyboard – It looks a lot like iPhone keyboard with multiple-languages support. 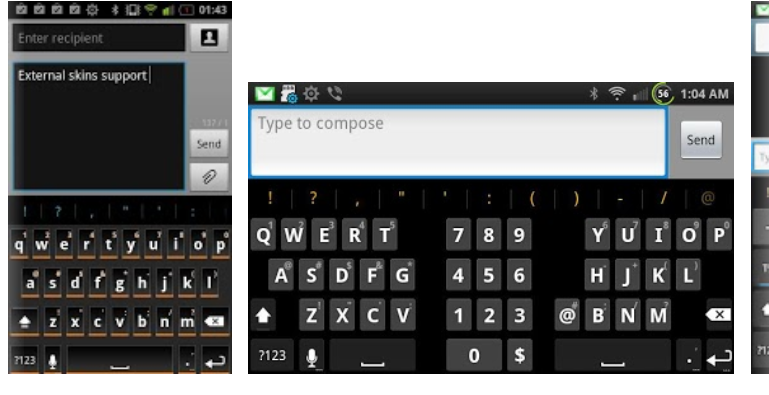 It offers T9 and compact mode, custom auto text, hard-keyboard support, several appearance options. It is paid app. TO buy it, just visit Google Play Store from your android phone. Perfect Keyboard Pro – This keyboard offers full customization of keyboard colors, background, sound style, keys size, keys spacing, split layout, etc. This one is also paid. Get it from android market a.k.a Google Play Store.